Paul Goldschmidt is quickly emerging as one of the top hitters in baseball. But will he be a hobby superstar? Paul Goldschmidt cards and memorabilia are on the rise. However, if history is any indication, playing for the Arizona Diamondbacks could keep them from reaching their full potential. Shop for Paul Goldschmidt cards on eBay. Goldschmidt joined Arizona in 2011 with lots of fanfare. While he showed some potential, he was far from spectacular. He showed improvement during his first full season in the desert, knocking 20 home runs and raising his batting average to a respectable .286. When the Diamondbacks traded Justin Upton, one of the team's offensive cornerstones, before the 2013 season, a lot of pressure was put on Goldschmidt to continue his development. He's responded better than anyone could have imagined. Goldschmidt has proven to be a run-producing machine in 2013, hitting for power, average and driving in runs at an obscene rate. 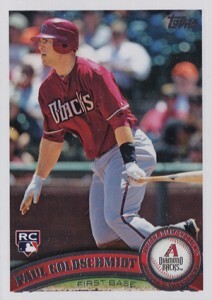 The first Paul Goldschmidt cards came out in 2010. These include autographs in both 2010 Bowman Platinum and 2010 Donruss Elite Extra Edition. Neither are part of a MLB base set though, so his rookie cards are generally recognized as coming from 2011 products. While collector interest in Paul Goldschmidt cards is going up, it's going to be tough for him to become an elite-level hobby star. Arizona is often overlooked. It's not a hotbed for big-name standouts, at least as far as recognition goes. But that might not be a bad thing. Even his top cards remain largely affordable, giving nearly all collectors a chance to get in on the action without a huge amount of risk. 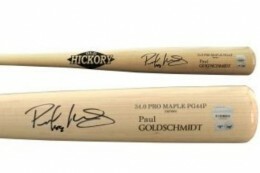 Autographed Paul Goldschmidt memorabilia is still relatively rare. He has been a regular signer in several baseball card products, though. This has kept his signature easy to find at reasonable prices. 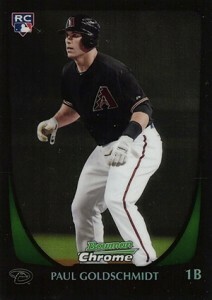 A very straightforward rookie card, the 2011 Bowman Draft Paul Goldschmidt will likely never pass a few dollars. Because it's cheap enough, most collectors don't seem to mind paying a small premium for the Bowman Chrome Draft version. As far as official rookie cards go, this is probably the best choice as far as non-premium sets go. It's inexpensive and carries the Bowman Chrome prestige. Refractors are also extremely popular. 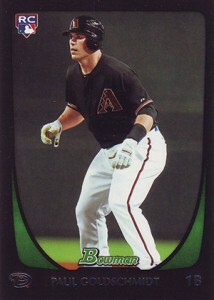 The 2011 Bowman Chrome Draft Paul Goldschmidt rookie card is found in the same packs as the regular Bowman Draft card. If you're looking for a rare Paul Goldschmidt rookie card, this is it. Base cards are sparse in this premium product. As a result, it doesn't show up as often as some may think. Even so, it's still very affordable. Is it a rookie? That depends on your view of a rookie card. 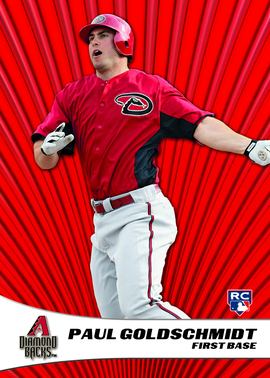 The 2011 eTopps Paul Goldschmidt was offered online for just one week and was limited to 749 copies. Many of these remain in storage with eTopps, making it one of the first baseman's rarest 2011 cards. Collectors should be aware that there's also a minor league eTopps card that was released shortly beforehand. 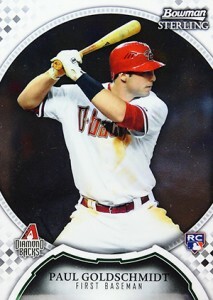 The 2011 Topps Update Paul Goldschmidt has the cleanest design of all his rookie cards. Along with Bowman Draft, it's also one of the cheapest. This card is perfect for those who want an attractive card and aren't really worried about value. 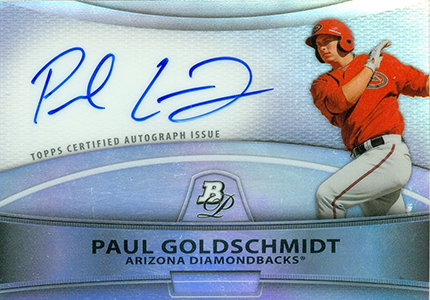 The 2010 Bowman Platinum Paul Goldschmidt is his first autograph in a Diamondbacks uniform. Yet, it's currently cheaper than his 2011 Bowman Chrome autograph. Part of that has to do with the heightened brand awareness of Bowman Chrome. However, Bowman Platinum is coming into its own. Collectors may see this as a sleeper card waiting to burst. 2010 Donruss Elite Extra Edition is a cheaper alternative to both the 2010 Bowman Platinum and 2011 Bowman Chrome Paul Goldschmidt autographs. Besides the lower price tag, it also has the advantage of being serial numbered. Where the card suffers a little is with its lack of licensing and sticker autograph. 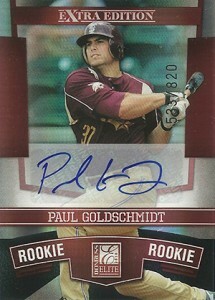 The 2011 Bowman Chrome Prospect Autograph Paul Goldschmidt is seen by many as his best card. 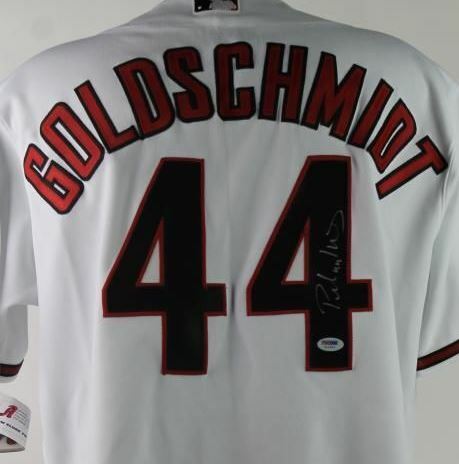 Released early in the 2011 season, it came out before Goldschmidt made his MLB debut. As a part of the Prospects section of the set, it's not an official rookie card. That said, it's traded heavily and would be considered the cornerstone of any Paul Goldschmidt card collection. Below you will find an example of what Paul Goldschmidt's authentic signature looks like. This can be used as a first point of reference for determining the legitimacy of autograph memorabilia, but is not a substitute for having your items authenticated by a well-respected professional autograph authentication company. Some of the trusted sources within the sports memorabilia market include the following companies: PSA, JSA, and Mounted Memories. The signature is rushed and consists of few characters. The letter "P" is legible and almost always with a closed loop. The letters "a-u" are sometimes present, sometimes not, on trading cards, he tends to leave them off and include them on memorabilia items as you can see in the below examples. The "l" is usually visible, regardless of what is being signed. The characters for "Goldschmidt" resemble a lower case "r" and the number "2."